Built-in security: Only the keys included with your cash box will open the lock. Each key is keyed differently. Extra-capacity cash box has additional storage area under removable, 6-compartment tray. 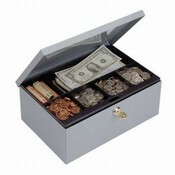 Cash box is made of heavy guage steel construction. Size: Low Profile: 11 1/4" x 7 1/2" x 2"; Extra Capacity: 11 1/4" x 7 1/2" x 4 3/4". Priced each.